Belarde Company’s leadership team possesses over 40 years of experience in general contracting, providing project management and field personnel with expertise in commercial and industrial general construction services. Our company and its employees’ strong commitment to quality, safety, and value provides preconstruction services, site evaluation, design development, budgeting, scheduling, and construction services necessary to take a project from initial concept to completion. With a strong portfolio of both public and private sector clients, our firm is dedicated to ensuring a seamless building process, including client consultation, design, project estimation, quality control, managing subcontractors, materials management and safety compliance. In addition, we pride ourselves in our relationships with our clients, subcontractors and employees. Quality, safety, and integrity remain the cornerstones of our business. In addition to installing concrete surfaces and structures the Belarde Company provides a variety of specialized construction services. We install highway, street, and road signs per our customer’s specifications. From large permanent interstate highway signage to small residential street signs we have the experience to meet all your signage installation needs. Our sign crews provide a wide range of sign installation services for Federal, State, local and private sector customers. We are adept at erecting traffic signs, ground or bridge mounted signs, cantilever and overhead sign structures, and custom signs for private property. Belarde Company is certified to install Transpo Break-Safe® systems. Break-Safe® is an omni-directional breakaway support system for ground mounted signs located within roadside clear zones and other locations vulnerable to vehicular impacts. The omni-directional performance of Break-Safe® allows the system to break away with consistent, predictable behavior, regardless of the vehicle’s angle of impact, thus saving lives and reducing property damage. 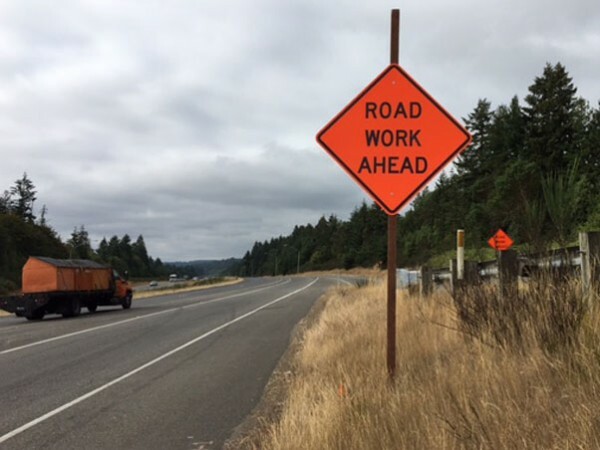 We also have the capability to install, maintain, and remove temporary construction signage, guidepost installations, and community mailbox installations. Sealing is used as a first defense against pavement deterioration because it offers several important benefits. The process of sealing concrete pavement seals the surface layers against the entry of water and prevents future deterioration of the roadway. In sealing a pavement surface, sealer is applied over the entire concrete pavement surface area. 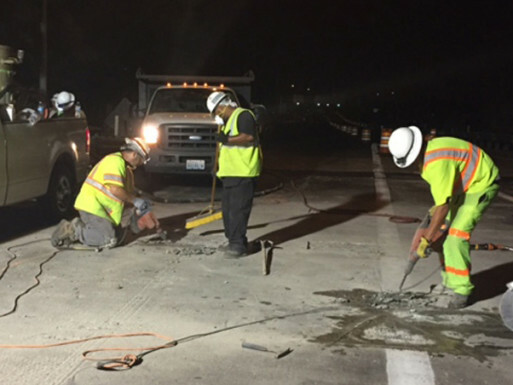 Joint and crack sealing helps preserve the pavement adjacent to the cracks; prevents sand, stone, and dirt from making its way into open cracks or joints causing compressive stresses; and extends pavement life by minimizing crack growth. Applying a sealant to the joint/crack will prevent problems from spreading and double the life of the pavement. Pavement repair in the early stages of deterioration will pay big dividends later by delaying costly resurfacing. Belarde Company’s employees are highly trained specialists that provide our customers with the assurance that the quality of the work will last for years to come. Belarde Company has developed the skills to not only self-perform their own concrete saw cutting; they now have the ability to provide this service to other contractors. Belarde’s flat sawing equipment and efficient operation assures a quick setup and minimal disruption to other on-going work. Belarde uses saws equipped with a diamond blade to cut horizontal, flat concrete and asphalt surfaces to any depth up to 24 inches. 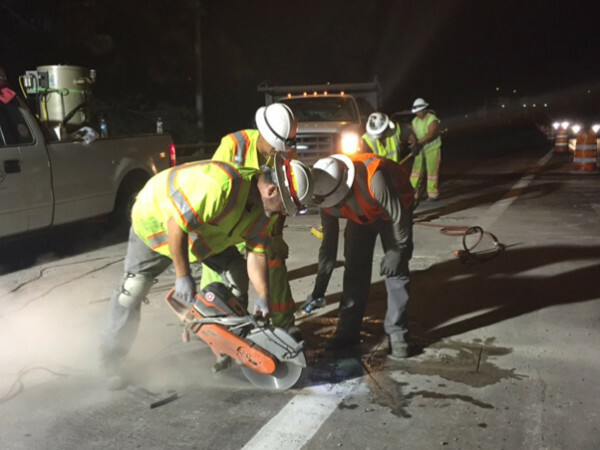 Typical flat sawing projects include highway patching, plumbing trenches, runway repair, structural foundations, parking lot re-pavement, residential and commercial enhancements, access and repair of broken water pipe or sewer lines. Sandblasting is one of the many methods the Belarde Company uses to texture the surface of hardened concrete. The amount of blasting may vary from light surface cleaning to a deep cutting operation that exposes aggregates to a three-fourth of an inch depth of more. Our experienced crews follow clearly defined procedures and precautions to insure an attractive surface. Belarde Company has the right equipment to complete the job correctly and applies sound safety practices on every job. The purpose of the application of waterproofing is to prevent the water to percolate or penetrate into any underground concrete members. When the water penetrates into the sub-grade concrete like foundation such as: mat foundation, footing, tie beam etc. the steel reinforcement that embedded in the concrete would corrode due to chemical reaction caused by water and the structure would eventually fail. Belarde’s trained crews have extensive experience in the application of membrane waterproofing systems. Their experience guarantees your project will receive the quality of workmanship to meet or exceed your expectations. The Belarde Company is a general contractor based in the Seattle area and servicing the entire Pacific Northwest in Alaska, Washington, Oregon and Idaho. If you have general contracting needs, please contact us.